In Watchman Nee’s book “The Breaking of the Outer Man and the Release of the Spirit”, he expresses that in order for Christ to flow freely out of us and into the world around us, we must be broken vessels. He gives example after example of life being released only once a vessel has been broken. One example Nee uses is a seed. In John 12:24, Jesus says, “Unless the grain of wheat falls in to the ground and dies, it abides alone; but if it dies, it bears much fruit.” He explains that it’s not a matter of whether the grain has life, but whether the outer shell is broken. How does this happen? Through temperature, rain, and the earth itself. All come together to break the shell of the seed, so the life of the grain can be exposed and grow. Another example Nee uses is the alabaster flask in John 12. Unless the flask had been broken, the pure oil would not have been released. Without the breaking, the precious ointment would have still been inside. The value wouldn’t have been released without the breaking of the outer shell. Wait a minute. You mean all those injuries, all those hurts, all those cracks in this hard shell are supposed to stay open? You mean I don’t have to “pick myself up and dust myself off”? You mean as I lay broken in complete surrender at the foot of the Cross, that’s when people see God in me? It’s not about “having it all together”, but really about falling apart? I’ve always thought that putting my broken pieces back together made me a “good Christian”, a stronger Christian, when in reality that was defeating the purpose. 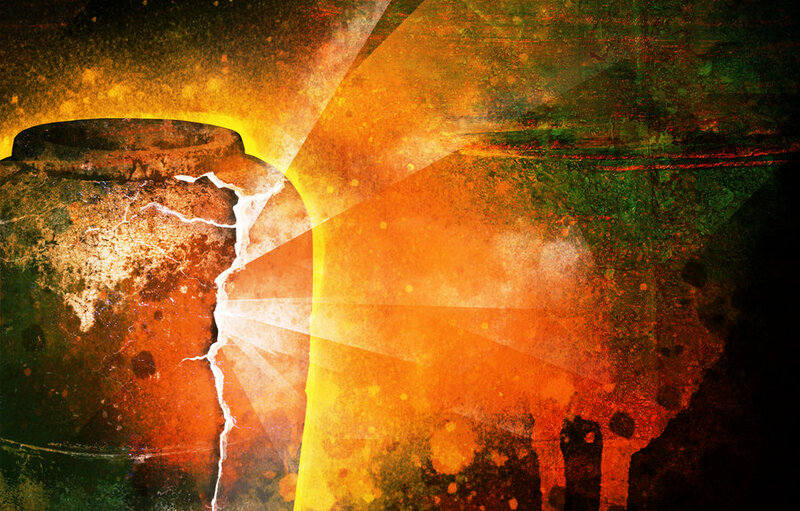 When I cement the pieces that God has broken away from me back with self-recrimination, doubts, discouragement, self-judgment, or whatever adhesive I’m using that day, all I’m doing is removing the places that the light of God can shine through. Then, He has to get His chisel out once again. When I realize all the wounds, the hurts, the disappointments that have become broken places in my life are for God to shine through, then it’s all worth it. Why would I try to put pieces back together that have always been meant to be exposed? How can I be the light of the world if I’m not willing to let Him shine through my broken places? I’ll admit, this is completely foreign territory for me. I’m really into “having it all together”. Believe me. But, I’m more into what God wants me to be, and this feels right. This concept of staying broken before Him makes sense. It’s about absolute surrender. It’s about being the branch and depending on our Vine. It’s about being the light in a dark world. If I have a hard shell, that doesn’t happen. If my alabaster flask stays closed, His life-giving ointment cannot flow onto others. I’m not talking about staying a victim. That’s unhealthy. What I am talking about is allowing God’s hand to remove the dry, crusty shell of a girl who has places in her life that are hard as a rock. Nee says that we can’t speed up the process, but we can extend it. I have definitely seen this in my own life. So, my prayer has changed quite a bit over the last few weeks. Instead of praying for ways to “get it together”, I’m praying for the places that need to be broken to be removed in His time and in His way. I’m praying for the continued willingness to let the pieces fall where He wants them to fall, and allow them to stay that way in order for His presence to shine through me. Let’s be broken together so that all people see is His light shining through.